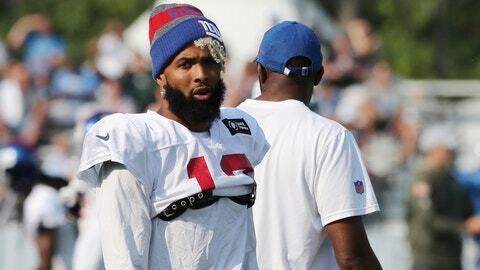 ALLEN PARK, Mich. (AP) — Odell Beckham Jr. looks as if he has fully recovered from ankle surgery. “Just to be back in the swing of things, I just feel like I’m back in love with what I’ve always loved,” he said Thursday. The 25-year-old Beckham broke his left ankle nearly 10 months ago, putting his short and stellar career in jeopardy. At the Lions’ training facility, there seemed no doubt Beckham is nearly healthy. And when healthy, Beckham is one of the NFL’s best receivers. The Giants don’t need to push rookie running back Saquon Barkley back onto the field with a strained left hamstring, and they probably will not in Detroit. The No. 2 overall pick was held out of practice for a third straight day and likely will not play in the team’s second preseason game.